The allure of Bali, a tiny diamond-shaped island located about eight degrees south of the equator in the middle of the Indonesian archipelago, has captured the public imagination as an exotic paradise since the 1930s. Known as Island of the Gods, indigenous beliefs and ancestor worship are interwoven with Balinese Hinduism in the midst of Islamic Indonesia. 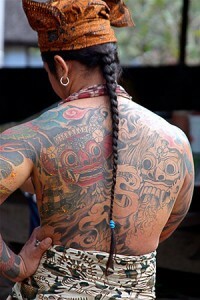 Vibrant cultural traditions are so entwined with notions of the sacred, that the Balinese have no word for religion. Gods descend to Earth, honored guests that inhabit deity statues, reside in threads of sacred textiles and participate in temple ceremonies and elaborate rituals. The gap between myth and reality is porous in Bali. Bali is home to some of the most important and spectacular ceremonial textiles in all of Southeast Asia. Textiles are mythological material, fibers of society that express the sacred and profane, communicate with and can transform those who come into contact with them through spiritual or magical practices. Vertical warp threads, long yarns that string the loom, create the structure and represent the eternal. Horizontal weft threads, yarns that interlace, represent the day-to-day. 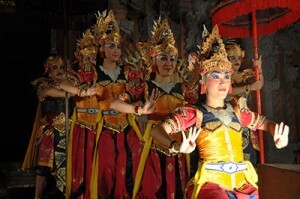 Bali’s dramatic history creates a complex multi-layered culture that constantly changes to adapt to new influences. An unexplainable and palpable magic resides in Bali’s terraced landscape of ethereal greens. Thousands of temples, drums and metallophones of gamelan orchestras, scents of incense, offerings of flowers, and sprinklings of holy water vivified by ritual, create a highly sensory society that facilitates connections between gods and humans. 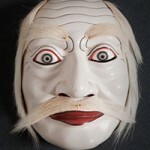 Art and beauty infuse daily life – every ritual and ceremonial performance is an offering to the gods. For the Balinese a real world of dangerous, invisible beings and forces lies under the surface of things. Sekala the realm of the visible is animated by niskala, invisible, ambivalent, potent, ever-present “wild-spangled” energy. 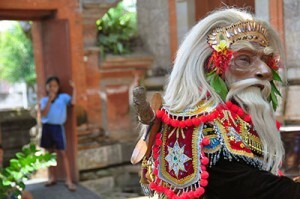 Vast hordes of demons, witches, evil spirits, revered ancestors and deities people the invisible world of the Balinese. Underlying visible reality lays the source of life, the foundation of magic, venerated and propitiated by offerings and rituals to the unseen energies. 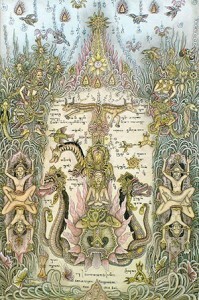 The Balinese mythos holds the world as one indivisible whole that contains magic, medicine and mysticism. The divine nature of their world is the focal point. Macrocosm manifests in the microcosm and vice versa. Bali is a world of inter-dependence, inter-relatedness and inter-penetration, in continual flux and interaction.